American fashion designer Isaac Mizrahi has spent his career capturing hearts from coast to coast. 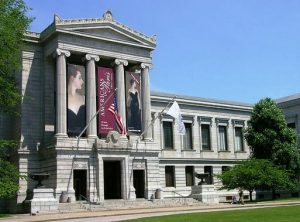 So tonight he came to Boston Fashion Week hoping to do the same.Mizrahi visited the Museum of Fine Arts to participate in the “Evenings with Creative Mind” program. He started by talking about his childhood fashion icon… his mother Sarah. “My father married her because her sweaters always matched her shoes,” he said, causing the audience to laugh for the first of many times. Sarah influenced her only son at a young age to embrace his creative side. Mizrahi remembered a puppet show he created when he was 13, which he said served as an escape from the reality of living in Brooklyn. He got his first sewing machine at 12-years-old. Isaac claims his designing, acting and producing is what keeps him happy. “I just like to work. When I’m not working, I’m not happy,” he said. Mizrahi is not happy with today’s fashion shows which he finds to be too frequent and theatrical. He claims many fashion designers believe their shows have to be a huge production, rather than a focus on the clothes themselves. Mizrahi ended his talk saying that a woman looks her best when she is comfortable. “If you want to do things, you should do them,” he said. He then admitted to spending a lot of his time playing computer bridge. “I don’t do it for any other reason than I want to,” he finished with a smile.